As the Second-in-a-Series, the USS Florida Punch Bowl is showcased as a holiday ornament that pays tribute to an American naval tradition of the early 20th Century. The Silver Punch Bowl is the signature piece of a 47-piece silver collection housed at the Governor's Mansion. It includes pelican handles, alligator feet and other Florida symbols, while the center engraving depicts the story of Florida's discovery by Juan Ponce de Leon on March 27, 1513. 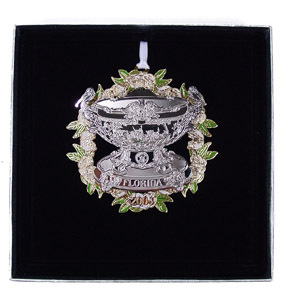 The Florida Governor's Mansion Foundation is proud to present this new ornament in which the image of the punch bowl is faithfully reproduced in imitation rhodium, set within a delicate 24 kt. gold-finished frame of orange blossoms.